A choice between an old pub and a refurbished coffee shop, at the East Horndon exit. The former Little Chef is now a Starbucks. 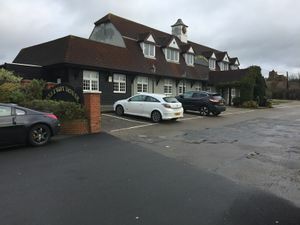 The Halfway House Pub was built in the 1930s, next to Keepers Cottage, on the Southend Arterial Road by its junction with Brentwood Road. The building next to it became an independent restaurant, and there was a petrol station there too. There was an additional restaurant and filling station on the westbound side, which became a nightclub called Elliots (later Twighlites) before closing, leaving behind two derelict buildings. In 1968 the remaining restaurant was purchased by Little ChefHistory to become their East Horndon branch. In 1982 they rebuilt it. A Little Chef Lodge was built in what was the back garden in 1985, which is now Travelodge. In 2002, a refurbishment saw it become one of the Little Chef Choices, whereby Harry Ramsden's and Caffe Ritazza were added, which were later removed. A Coffee Tempo! was also later added. 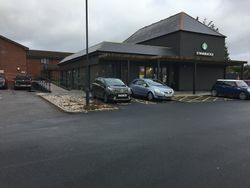 The Little Chef closed in 2017 and is now a Starbucks, operated by Euro Garages.